An organ built before 1850 has been re-assembled and restored at Our Saviour's Lutheran Church, after it was donated by a closed congregation in New York. A joyful noise is about to get louder at Our Saviour's Lutheran Church, where a rare two-century-old tracker pipe organ has been acquired. 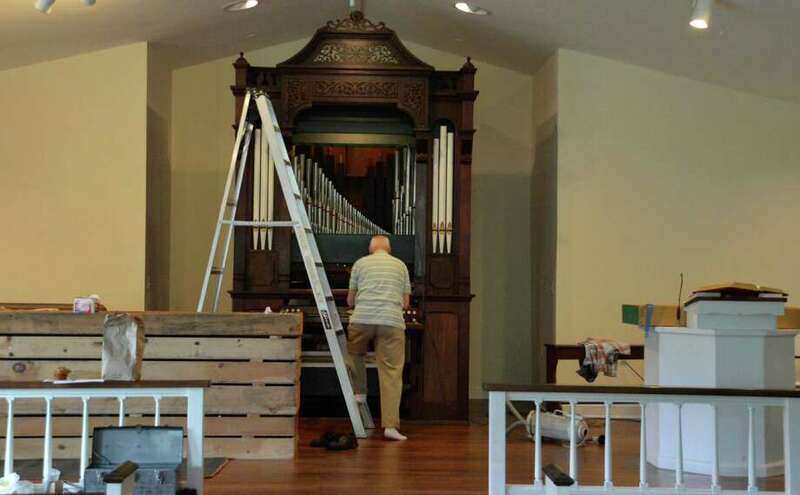 Thanks to a donation from a shuttered Lutheran church in Glendale, N.Y., and to the skills of the man who originally restored the organ more than 30 years ago and has done its upkeep ever since, the organ should be ready for this Sunday's service. Over the last several weeks, Jeremy Cooper -- an organ builder and restorer from Concord, N.H. -- has diligently and delicately re-assembled the organ at Our Saviour's, which will now stand as the centerpiece of the sanctuary. "We don't know who the original builder was, or when it was made," he said, "but it was before 1850." Originally built with no pedals in the English style of construction, and operated by a hand-bellows pump, the organ was reconstructed in about 1850 by a now-defunct Boston firm. Since that time it has served congregations in Maine and New York. "Music in worship has been a big tradition with the Lutheran church," said the Rev. Mark Christoffersen, the pastor. "The installation of the pipe organ will enrich our services of worship." "The great church reformer Martin Luther wrote, `Next to the word of God, the noble art of music is the greatest treasure in the world,' " he said. " `It controls our hearts, minds and spirits.' "
Cooper explained that Lutheran services in particular are historically founded on the inclusion of music. "This is not something to be a recital organ," he said. "It's to accompany the service ... Singing is a big part of Lutheran worship (and) a lot of the service is sung." Cooper himself began his trade decades ago in Boston, where a fellow organ player asked his help in restoring an old organ for a church that was on hard times. Until that time, he said, he had never played an organ with mechanical key action, and he was smitten by both the instrument and the restoration craft. "They're quite a few of us, but they're not so many as there used to be," he said, especially in New England, which is more frugal about spending money on church music compared to places farther south. "It's a lot of tedious work," Cooper said, having to climb up and down a ladder all day long to assemble and adjust the pipes, "but it's also exciting because you're nearing the point where it's going to make music again." The entire organ, including the walnut case in which it is housed, weighs about one-and-a-half tons, Cooper said. "There are a lot of different woods in it," he said, including original white pine and mahogany. The nine-stop organ has 58 manual keys, along with a 27-pedal keyboard. "We are very grateful that the members of the former Ascension Lutheran Church in Queens," Christoffersen said, "now members of a sister congregation, have generously given this pipe organ to Our Saviour's Lutheran Church where it can continue to accompany worshippers." Our Saviour's Lutheran Church, 160 Hill Farm Road, has services at 8:30 and 10:30 a.m. Sundays. For more information, visit: www.www.oursaviours.net.